In February, 1904 the State Capitol building was destroyed by fire. The Governor at the time was also a Republican. There are significant differences in how two Republican Governors – Robert M. La Follette and Scott K. Walker – viewed not just how they should govern, but also the role of the citizens in our Democracy. In the eyes of then Governor Robert M La Follette the Rotunda area, when rebuilt, was to be used as a public forum where people can gather for various events, and when necessary, play an active role as participants in how the state is run. It is not just the right of a citizen to actively participate in a Democracy, but their duty. The Solidarity Sing Along events have never posed a threat to public safety, and are held only through the noon hour when official business is not in process. The Solidarity Sing Along is exactly what the Rotunda was built for. The participants of the Solidarity Sing Along check every day for scheduled events, and when there are events posted, we sing outside. We are angry, but gentle people. The rights of the people to peacefully assemble, and for all people to be able to petition the government, is critical in a democracy. Petitioning the government can take many forms, and this has worked for many years. Of course all public buildings need rules, but these rules should enhance the rights of the people to exercise their rights instead of limiting speech. In February of 2011 our newly elected GovernEr introduced sweeping legislation in the form of a Budget Repair Bill that would profoundly change the vision of our state’s institutions that govern labor relations, education, health care and more. For six weeks the capitol halls and rotunda were filed with average citizens who needed to express their views, and testify in opposition to these changes. The people of our state wanted to have their voices heard, and to participate in the democratic process. Four weekends in a row, over one hundred thousand people filled the capitol square, and occupied the capitol building to raise awareness that debate and discussion was needed. During that time, not a single window was broken, and no property was damaged. The reason is because the people had a place to vent their opposition to what was happening, and there was a tradition of compromise and fairness in our legislative process. The people felt that they could effect change to something that was perceived to be very wrong. 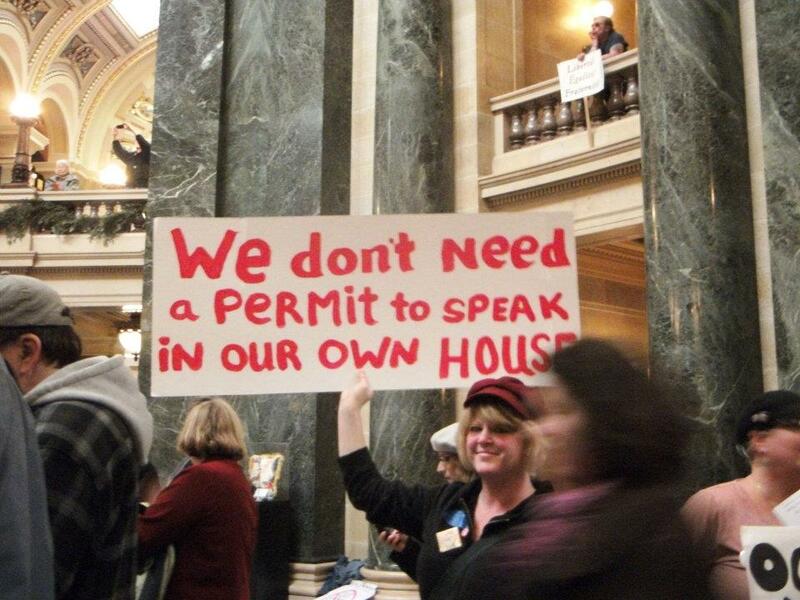 GovernEr Walker’s response was to close the capitol and lock out the citizens he is supposed to work for. Dissent is not welcome in the People’s House. In summary, the difference between these two Republican Governors is the American Legislative Exchange Council – ALEC. 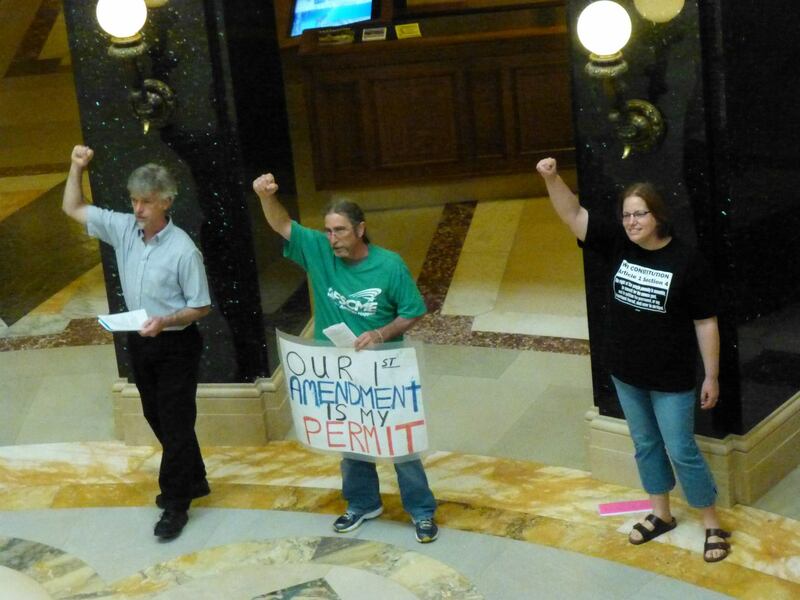 The people of Wisconsin elected Scott Walker to represent them, not ALEC. 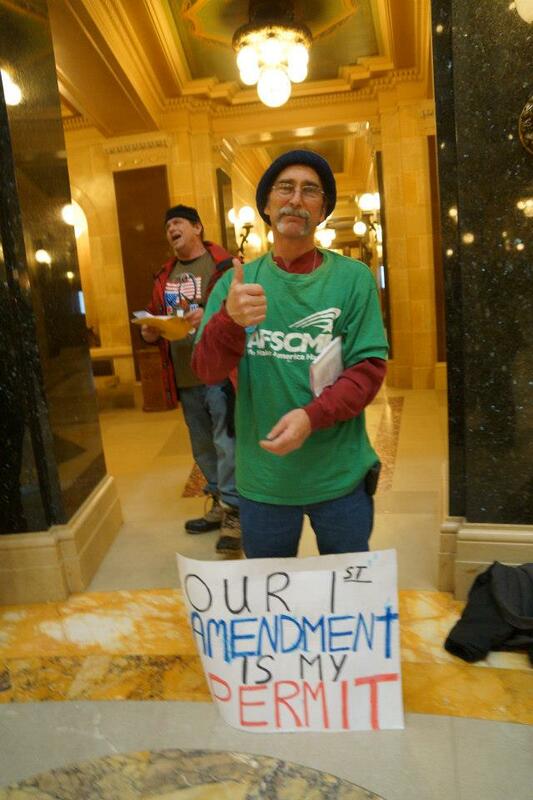 All of the legislation that has been pushed through by the majority party is not written by Wisconsin elected representatives, but is prewritten by ALEC, and as proof the same legislation is appearing in other states with similar political majorities. I don’t understand how this does not fall under the RICO Act, but I am only an electrical engineer, not a lawyer. 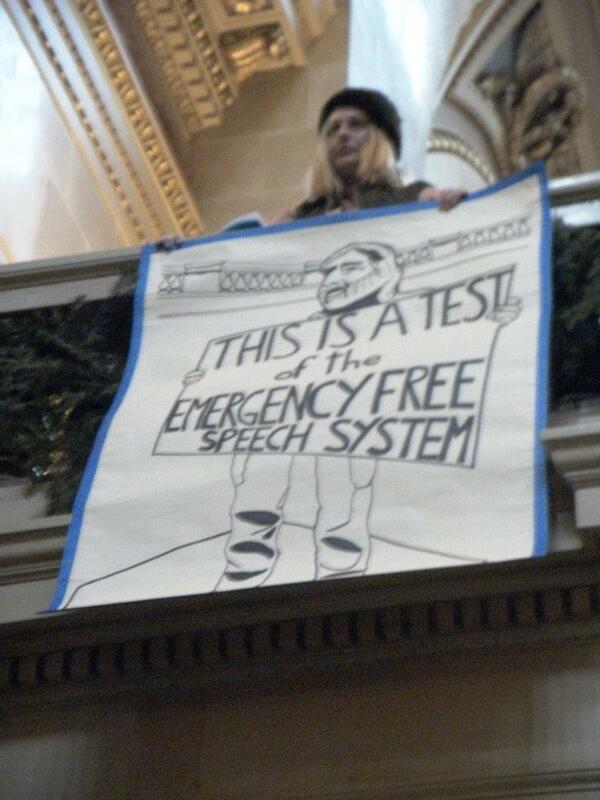 That is the real emergency we need rules for, not a few dozen people singing each weekday afternoon in the rotunda. The participants of the Solidarity Sing Along are true patriots, and still believe citizens have a role in a democracy other than casting an occasional vote. When we do vote, we expect our elected officials to listen to the people and act in our best interests, rather than to have contempt for our voices. SHAME on all of you who are complicit.